RORY PATTERSON netted his ninth goal of the season and Derry City secured their 50th clean­ sheet against Bohemians as they collected three valuable points at Dalymount Park. It was City’s first win at the Dublin venue since 2013 when Celtic’s Michael Duffy netted both goals in a 2-0 victory over the Gypsies and the vital win took the Candy Stripes five points clear of fourth placed Shamrock Rovers and saw them close the gap on second placed Cork to three points. Bohs had made five changes to their side which lost the Dublin derby at Shamrock Rovers, with goalkeeper Shane Supple and Ian Morris getting their first start for the Gypsies. As for City, Kenny Shiels brought in Lukas Schubert and Joshua Daniels to the starting line­up, replacing Ronan Curtis, who dropped to the bench, while Nathan Boyle missed out completely. City started on the front foot and some great passing opened up the Bohs defence on 10 minutes and resulted in the opening goal. Barry McNamee and Aaron McEneff linked up well down the left ended with Conor McCormack’s clever cut­back finding Patterson, who made no mistake firing home his ninth goal of the season. The home side, with striker Ismahil Akinade a threat throughout the opening 45 minutes, went close in the mid­way point of the half but Eoin Wearen’s long range strike was tipped over by City keeper Gerard Doherty. Some more neat passing by City meant they were frustrating the home side fans, as their team wasn’t getting everything their own way. The visitors should have doubled their on 42 minutes when a good strong tackle by McEneff released the dangerous Schubert and his superb right wing centre found and unmarked Patterson but his close range header was easily saved by keeper, Supple. Right on the stroke of half­-time Derry had another half­ chance as McNamee got in behind the Bohs back­line after Dave Mulcahy was caught out, but the Ramelton man’s cut­back was cleared by Derek Pender. Bohs thought they had levelled things on 58 minutes but Jake Kelly’s celebrations were cut short as the referee’s assistant’s flag was raised and the effort was ruled out. Moments later Schubert on the counter­-attack saw him get at Mulcahy, but his left footed strike from 20 yards was saved by Supple. Former Derry striker Mark Quigley came off the bench for Bohs and he had a super chance to level things on 72 minutes but his attempted lob over Doherty was superbly saved, after Niclas Vemmelund’s initial back­header was well short. 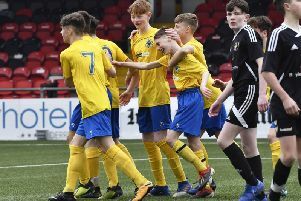 On 80 minutes City had a glorious chance to double their lead as McNamee’s right footed cross from the left found an in­rushing Conor McCormack, but his volley from 10 yards, which had Supple beaten, flashed just wide. Bohemians: Supple, Pender, Lopes, Byrne, Wearen (Byrne 71), Kelly (Quigley 59), Kavanagh (Chindea 88), Mulcahy, Ben Mohamed, Morris, Akinade. Derry City: Doherty, McDermott, Vemmelund, Barry, Jarvis; McEneff, McCormack; Schubert (Monaghan 71), McNamee, Daniels (Boyle 71); Patterson (Allan 95). Referee: Mr Neil Doyle (Dublin).